Good luck finding anything on the State Department’s website about former Secretary of State Rex Tillerson. 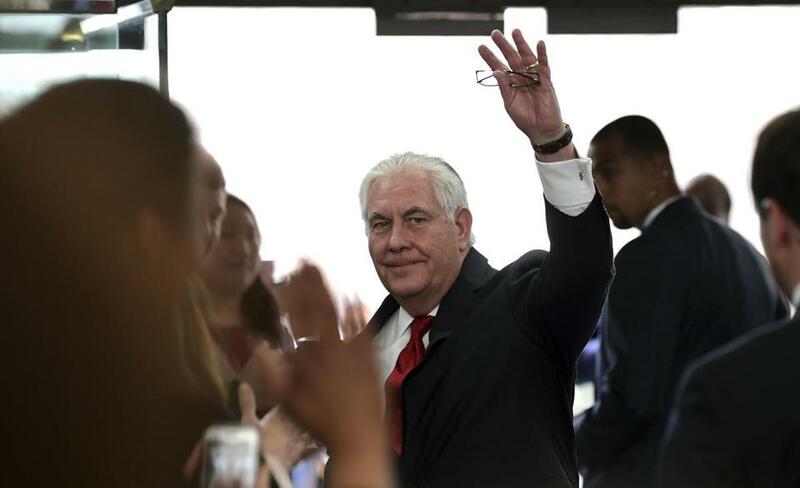 WASHINGTON — Rex Tillerson has all but vanished from the State Department’s website as his unceremonious firing by tweet took effect over the weekend. The ‘‘Secretary of State Tillerson’’ link at the top of the department’s homepage disappeared overnight Saturday and was replaced with a generic ‘‘Secretary of State’’ tab. When clicked, it leads to a page that informs visitors in a brief statement that Deputy Secretary of State John Sullivan ‘‘became acting Secretary of State on April 1, 2018.’’ It shows a photo of Sullivan signing his appointment papers as deputy in June 2017 but offers no explanation for the change in leadership. In addition to that change, links that had connected to Tillerson’s speeches, travels, and other events now display those of Sullivan. The link to Tillerson’s biography as the 69th secretary of state returns a ‘‘We’re sorry, that page can’t be found’’ message. Since it first launched a website under President Clinton, the State Department has moved former secretaries of state information to its archives section, but those have not usually been updated until a change in administration. Tillerson is the first top American diplomat to serve fewer than four years in office in the website era and one of the shortest-serving secretaries of state in the modern era. It was not immediately clear when Tillerson’s information would be archived. President Trump fired Tillerson in a Twitter post on March 13, but his departure did not become official until Saturday. Sullivan will continue as acting secretary of state until Tillerson’s designated successor, CIA director Mike Pompeo, is confirmed by the Senate, possibly later this month.